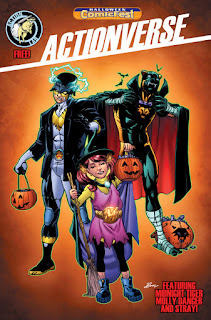 Fellowship Previews: This Halloween...Enter the ACTIONVERSE! The superhero has been a mainstay of comic books since 1938 and is synonymous with wall crawlers, dark knights, and other four color characters. This Halloween, Action Lab Entertainment presents its first ever superhero crossover, ACTIONVERSE, which also doubles as a new branding initiative for it’s creator owned superheroes. "We'd been sort of talking about it before San Diego last year and I loved the idea; It just seemed like a natural match,” said MOLLY DANGER creator, Jamal Igle. “The idea of having Molly Danger, Midnight Tiger and Stray all connected as characters came out organically. They compliment each other as characters and at the same time bring different elements of the traditional superhero dynamic to the story.” When asked about how four different creators could pull a story like this together, Igle said, “A lot of it has to do with the relationships I have with Vito, Sean, and Ray, and over the course of our planning, we've created a history between Molly and Rodney Weller that goes back years to his sidekick days. It's been a lot of fun to put together." 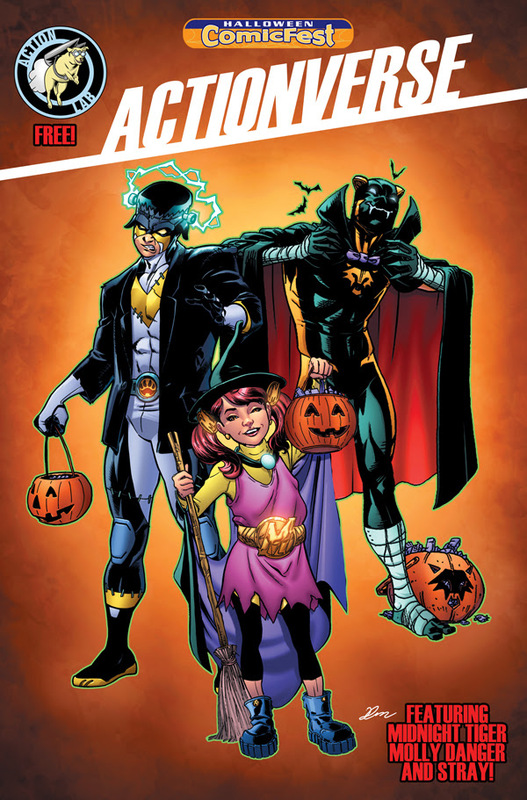 HALLOWEEN COMICFEST: ACTIONVERSE begins with a preview of the Actionverse mini-series with a story done by Igle (MOLLY DANGER), Vito Delsante and Sean Izaakse (STRAY) and Ray-Anthony Height (MIDNIGHT TIGER). This story will be fully available in November. "Working so closely with such talented and passionate creators that have put so much love and heart into these characters that is just inspiring and so much fun,” said STRAY co-creator, Sean Izaakse. “It's basically like creating works of art with friends who feel like you do. Not to mention it's a blast getting to draw these characters, and seeing how they interact and form relationships has been a blast to develop and I think everyone, from fans of the individual titles as well as newcomers of all ages, will love them." HALLOWEEN COMICFEST: ACTIONVERSE also previews a new all-ages comic book called, ACTION LAB: DOG OF WONDER, written by Delsante and newcomer, Scott Fogg. In the vein of HERO CATS, ACTION LAB will focus on dogs, specifically, the Labrador retriever in the company’s logo! HALLOWEEN COMICFEST: ACTIONVERSE is currently available for pre-order in Diamond’s Previews catalog as one of the many ComicFest comics offered this year (JUL150017) and comes with a cover by Igle, Height and Izaakse.